To spy an individual molecule in a throng of millions, to seize it, and to manipulate it. ... To arrange atoms into an ordered nanotechnology landscape of precisely spaced steps and terraces. ... To determine the size of an electrical current by tabulating, one by one, the number of electrons flowing by. ... To gauge distances in increments tinier than the radius of an atom. ... To measure the strength of a chemical bond between an antibody and a virus particle. 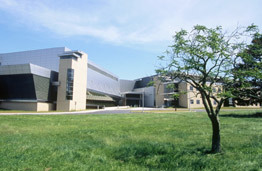 The NIST Advanced Measurement Laboratory was designed by HDR Architecture Inc., and built by Clark/Gilford, Joint Venture. These and other extreme capabilities are key to the nation's high-technology future, the competitiveness of its industries, and the health and well-being of its citizens. They are essential for our nation to realize the societal benefits and seize the commercial promise of the nanotechnology discoveries now being made in laboratories around the world. And they are among the goals of more than 100 horizon-stretching research projects housed in the Advanced Measurement Laboratory (AML) Complex at the National Institute of Standards and Technology (NIST). 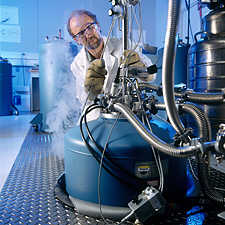 Completed in 2004, the AML Complex has few—if any—equals among the world's research facilities. It offers an unprecedented combination of features designed to virtually eliminate environmental interferences that undermine research at the very tip of the leading edge of measurement science and technology. Accomplishments at the AML Complex will translate into new high-accuracy measurement technologies, databases on the fundamental properties of "nanostructured" materials, and other essential supporting tools and capabilities. U.S. industry and its university and government partners require these infrastructural technologies if they are to succeed fully in scaling today's feats of molecular science and engineering into nanotechnology products and processes for domestic and international markets. Practical benefits will flow to diverse industries and areas of need—from environmental protection to homeland security to biotechnology. The NIST Advanced Measurement Laboratory includes sophisticated low-vibration "clean rooms." Here, materials researcher Stephen Hsu prepares to measure nanoscale friction between a diamond tip and a silicon surface. Such measurements are needed for the design of nanosized gears and other devices that will become the nanomachinery of the future. Scientists and engineers working to push beyond the limits of today's advanced technology crave stability. Even tiny variations in environmental conditions—a hundredth of a degree rise in temperature, vibrations from local traffic, a flutter in electrical current—can plunge the results of the most carefully designed experiment into ambiguity. Consider the laser, one of the workhorse tools of modern research, used to analyze, print, scan, cool, heat, and more. Variations in temperature along the length of a laser beam distort the focus; vibrations misalign beam and molecular targets; and electromagnetic interference causes the wavelength to change, introducing errors that can dominate measurements and completely obscure the process being studied. At the AML Complex, high levels of environmental control enable researchers to make the most of a growing assortment of powerful, but highly sensitive, instruments for exploring, innovating, and manufacturing. Nearly eliminating external disturbances makes it easier to measure accurately—to know something for sure. It reduces uncertainties that obscure critical interactions occurring in exceedingly small spaces in the span of billionths or trillionths of a second. The AML's meticulously controlled environment permits researchers to focus directly on still-formidable challenges, such as teasing out cause and effect, definitively linking structure and function, or simultaneously achieving high levels of specificity, sensitivity, and spatial resolution in chemical analyses. Their results will provide clearer guidance on the road to nanotechnology commercialization and practical applications. Ultraprecise electrical measurements require extremely stable temperature, humidity, and vibration control. Here, a NIST physicist in one of the AML's metrology laboratories prepares to measure the international standard for resistance— the quantum Hall effect. Consisting of five wings, including two that are entirely underground, the 49,843 square-meter (536,507 square-foot) AML Complex houses 338 reconfigurable laboratory modules, and over 5,600 square-meters (60,000 square-foot) of NanoFab laboratory space, including an 1,800 square-meter (8,000 square-foot) cleanroom, with 750 square meters (8,000 square-feet) at Class 100/ISO 5. While environmental-control requirements are tailored to categories of scientific need, no other facility of this size has so successfully achieved the combined features of strict temperature and humidity control, vibration isolation, air cleanliness, and quality of electric power. Air Quality—Laboratories: All air fed to AML laboratories is filtered with HEPA (high efficiency particulate air) technology, delivering about a thousand-fold improvement in air cleanliness over NIST's existing general purpose laboratories, which were state of the art when built in the 1960s. In some areas, air quality is further improved to achieve even more stringent levels of air cleanliness (Class 1000/ISO 6 or better). Air Quality—The NanoFab Cleanroom: 3.5 particles per liter of air (Class 100), where air cycles through a HEPA filtering system over 300 times each hour; upgradable to Class 10/ISO 4. Temperature: From baseline temperature control within ±0.25 degree Celsius to within ±0.1 or ±0.01 degree Celsius for 48 precision temperature-control laboratories. Vibration: From a baseline velocity amplitude of 3 micrometers per second, down to 0.5 micrometers per second or less in 27 low-vibration modules—15 to 100 times better than in NIST's general purpose laboratories. Humidity: From a baseline control of ±5 percent down to ±1 percent in special laboratory sections—compared with ±20 percent in NIST's existing general purpose laboratories. Electrical Power: AML-wide uninterruptible power supply prevents outages and counters voltage spikes, drop-outs, and other "dirty power" problems that limit accuracy and precision, reduce analytical sensitivity, and cause long-running experiments to crash. Green Building Features: Natural daylighting, energy conservation, and recycling emphasized in AML design and operation. 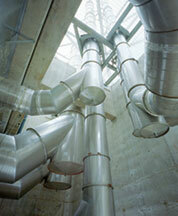 The complexity of the AML requires 116 air-handling units and over 200 exhaust fans. Credit: Photo by HDR Architecture, Inc. The AML contains 48 laboratories to support research projects requiring the most exacting levels of temperature control. In 36 of these, the average room air temperature is controlled to ±0.1 degree Celsius; in another 12 to ±0.01 degree Celsius—a level of control never achieved in a project of this magnitude. The AML's high-accuracy, temperature-control laboratories are outfitted with arrays of high-precision thermistors and humidity sensors. Electronic devices that change resistance in response to changes in temperature, the thermistors serving the ±0.01 degree Celsius laboratories were individually calibrated by NIST researchers to ensure a tolerance of less than ±0.003 degree. This extreme accuracy is necessary for input into the precision direct-digital-control systems serving the AML laboratories, keeping them within the hundredth-of-a-degree margin. To prevent jostling during the assembly of atomic structures and to shield ultrasensitive instruments from all but the slightest quiver, 27 specialized AML laboratories offer the ultimate in vibration isolation. These modules are located about 12 meters (40 feet) below ground level in structurally isolated building wings, a first line of defense against vibration. Instruments sit atop specially designed, heavy mass isolation slabs supported on pneumatic "air springs." An isolated, raised floor system spans over the pit containing each isolation slab so that researchers can run their experiments without affecting the isolation systems. To continue to advance microchip technologies, scientists are studying ways to assemble individual molecules for use as active circuit components. 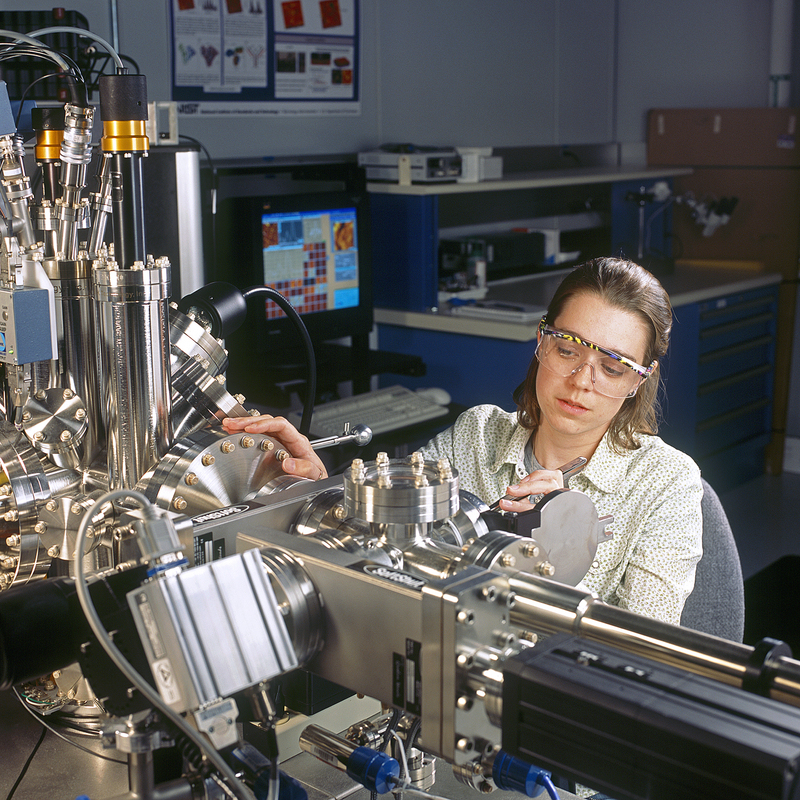 In the Advanced Measurement Laboratory (AML) shown above, postdoctoral researcher Lucile Teague inserts a sample into a scanning tunneling microscope to study the electrical behavior of organic molecules on a gold surface. The AML is designed to be the world's best measurement laboratory. NIST and its partners will be able to produce the measurements and standards needed to move key 21st-century technologies from the research horizon on to the factory floor. 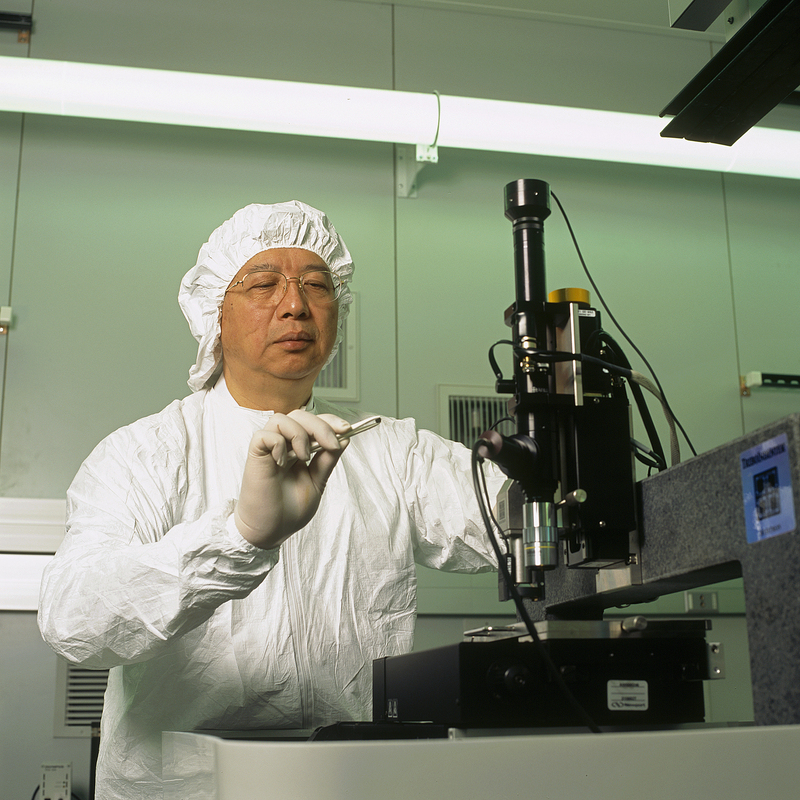 The AML's Nanofabrication Facility, for example, will enable development, prototyping, and evaluation of dimensional references, specialized test structures, and nanotechnology tools and devices basic to efficient processing of real-world products containing essential nanotechnology components. To be operated as a user facility, it will provide NIST's collaborators with access to expensive nanofabrication tools and specialized expertise in a shared-cost environment. Demonstrate capabilities for preprogrammed, automated assembly of thousands of atoms into complex working structures, revealing the physical principles and key variables that define "bottom-up" nanomanufacturing processes. Greatly increase the range and accuracy of NIST's high-precision, laser-based capabilities for calibrating light detectors, delivering an improvement in "visual perception" vital to industries ranging from electronic displays to automobiles and research applications ranging from environmental sensing to astronomy. Develop and demonstrate the technologies and underpinning measurement methods required to position, manipulate, assemble, manufacture, and integrate across scales ranging from nanometers to millimeters—or from the nanoscopic to the macroscopic. Examples include positioners, sensors, and actuators, as well as design tools, modeling methods, data exchange formats, image analysis techniques, and control system architectures. Develop a self-calibrating standard for capacitance—a measure of the ability to store an electrical charge—by counting and directing about 100 million electrons onto a plate of a cryogenic capacitor and then determining the voltage that develops. The result will be a commercial standard useful to many industries, including defense, and to basic research. Measure and manipulate single molecules. Results of traditional chemical and biochemical experiments are an average of the behavior of millions or billions of molecules en masse. But in cells, proteins and other biomolecules often act one at a time. NIST's single-molecule measurement and manipulation program is developing ultrasensitive techniques for directly probing and measuring individual molecules and controlling them in a single "lab on a chip."